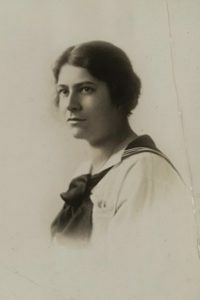 Natalie Gray was born in Colorado Springs, Colorado in 1894 and was the daughter of the treasurer of Colorado branch of the National Woman’s Party (Doris Stevens, 360). At the age of 22, Gray’s mother sent her to the National Woman’s Party headquarters in Washington D.C. and told the party, “I have no son to fight for democracy abroad, and so I send my daughter to fight for democracy at home” (Irwin, 480). After arriving at the National Woman’s Party headquarters, Gray became active in the fight for women’s suffrage. On August 16, 1917, Gray set off to protest in front of the White House. She and her fellow suffragists marched with a banner that read, “Kaiser Wilson, have you forgotten your sympathy with the poor Germans because they were not self-governing? Twenty million American women are not self-governing. Take the beam out of your own eye” (Irwin, 237). As the suffragists took their place in front of the White House gates, fifty police officers surrounded the women and, rather than protecting the suffragists from being attacked, the police officers attacked them themselves (Irwin, 240). Gray, along with Virginia Arnold, Lucy Burns, and Elizabeth Stuyvesant, took the brunt of most of the police brutality. As the day wore on, a crowd began to surround the White House gates and many spectators joined the police in their attack of the suffragists. The attacking mob focused on destroying the banners of the suffragists in order to discourage the women from their efforts. Despite the violence they faced, Gray and her fellow suffragists set out the following day, August 17th, to picket the White House again. This time they held two banners that read, “England and Russia are enfranchising women in war time” and “The government orders our banners destroyed because they tell the truth” (Irwin, 243). The suffragists and their banners drew a large crowd to the White House gates, giving the police an opportunity to arrest the women for obstructing traffic. Gray was arrested with five other women and was brought to trial that same day. Their trial only lasted forty minutes and “they refused to pay the ten dollar fine which, though it would have released them, would have also been an admission of guilt” (Irwin, 243). Gray and the other women were sentenced to thirty days in jail. She served her sentence in the Occoquan Workhouse and after her release remained active in the fight for women’s suffrage. Sources: Inez Haynes Irwin, The Story of Alice Paul and the National Women’s [Sic] Party (Fairfax, Va: Denlinger’s Publishers, 1977). Doris Stevens, Jailed for Freedom (New York: Boni and Liverwright Publishers, 1920).